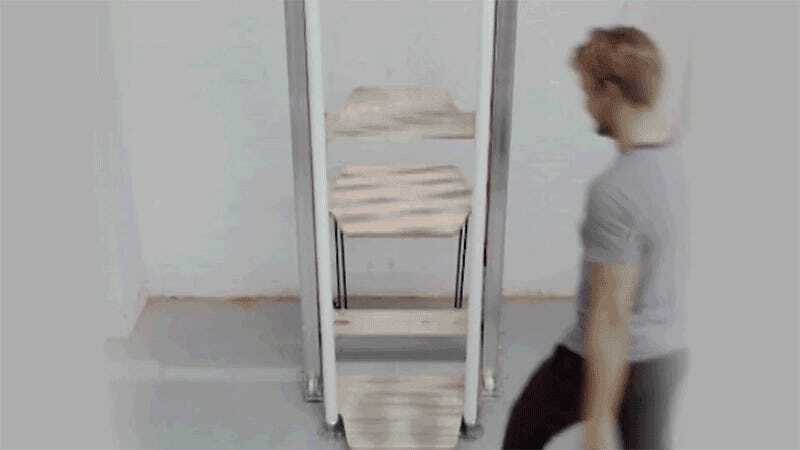 A team of designers from the Rombaut Frieling Lab in Eindhoven, Netherlands, have created what they believe is the perfect hybrid between stairs and elevators: an unusual contraption called the Vertical Walking that lets people move between floors with minimal manual effort. Elevators only work as long as there’s electricity to power them, requiring space-wasting stairs to be installed in buildings as an emergency backup. They also contribute to the obesity epidemic. Deep down we all know we should be taking the stairs, but not when you live or work on the 80th floor of a skyscraper. The awkwardly-named Vertical Walking contraption works like an elevator in that it operates in a vertical motion, but that’s where the similarities end. Instead of just pushing a button and then standing around until it reaches your floor, the Vertical Walking requires riders to manually propel themselves from floor to floor using their arms and legs. It looks exhausting, however, using a series of cleverly engineered springs, elastic ropes, and a pulley system, the Vertical Walking requires less than ten percent of the energy one would exert while climbing a flight of stairs to move the same distance. 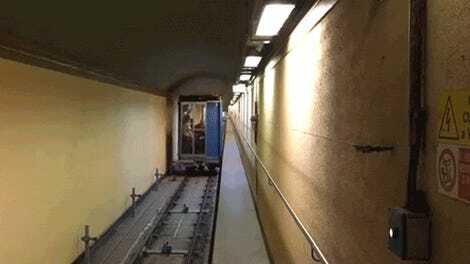 The prototype can even accommodate passengers with varying physical capabilities or limitations, although unlike an elevator, it won’t be able to lift those dependent on wheelchairs. As a result, while the Vertical Walking could theoretically replace stairs in smaller buildings, it’s doubtful employees working on the highest floors of a towering skyscraper are going to want to haul themselves up to work every morning, and back down at the end of the day. So elevators aren’t going anywhere, and if the option to just stand around and ride to your floor is there, who is going to opt for this?